Vanilla Cinnamon French Toast Casserole is a lightly sweet, vanilla, maple, cinnamon French toast batter that is poured over grain free, paleo, low carb bread cubes. This topped with a little melted butter or coconut oil and sprinkled with a little coconut sugar or low carb sweetener. I served this vanilla cinnamon french toast casserole with a little maple syrup and garnished with a few berries. My whole family absolutely loved having this for breakfast. The paleo and low carb version are both divine. 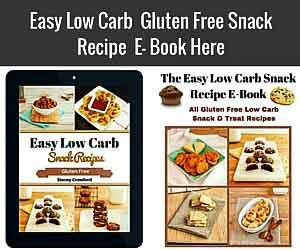 If you happen to already have your favorite paleo or low carb bread available, then you could also use that for the bread cubes. I did also include an easy, grain free, quick bread recipe for you to use as well. Those are not my hands in the pictures, they are cute elfin hands of my daughter. She does have very cute and tiny hands for a 25 year old. She did not enjoy doing this though, and complained quite a bit. I guess hand modeling is not in her future. I would have used my son’s hands, but he had icky stuff under his nails that would not come off, possibly permanent marker. 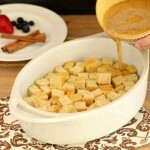 Vanilla cinnamon french toast casserole is a paleo and low carb breakfast treat. First list is braed ingredients, then french toast casserole below. tbsp Sweetener of choice: 2 pure maple syrup for paleo or for low carb use 2 tbsp low carb maple syrup,( I used Natures Hollow) or 1 ½ tbsp. erythritol granular. Preheat oven to 400 F, and grease or oil an 8 x 4 inch loaf pan. In a large mixing bowl, Combine all the quick bread ingredients and stir with a fork vigorously. Scraping the sides and breaking up any coconut flour clumps. Stir until smooth and clump free. Pour or spoon batter into prepared loaf pan. Bake for 20 to 25 minutes, or more, until center is firm. Remove and let cool completely. In a medium mixing bowl combine: 5 eggs, 1/3 cup unsweetened almond milk or coconut milk, 2 tbsp sweetener of choice,1 tsp GF vanilla extract, ½ tsp cinnamon,1/4 tsp allspice. Whisk together thoroughly. Set aside. Preheat oven to 400 F, and oil or grease a 9 inch (1 1/2 to 2 quart) casserole dish. Chop quick bread into cubes. Put bread cubes into the prepared casserole dish. 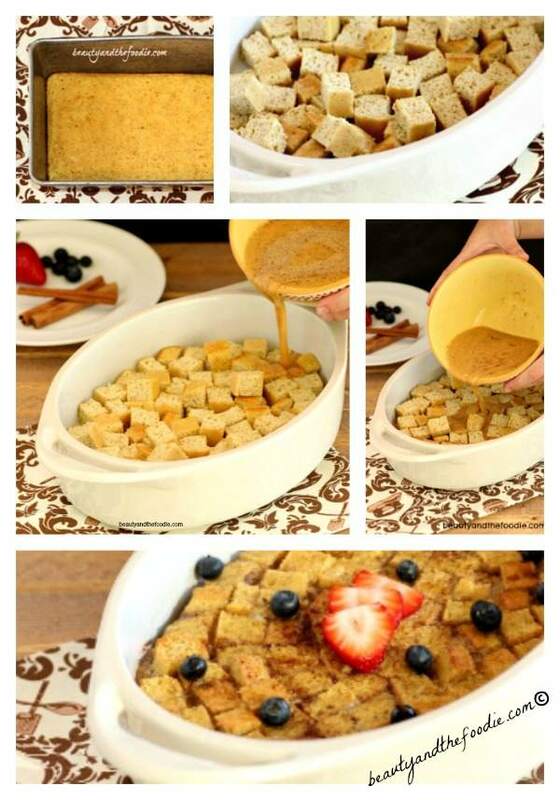 Pour vanilla cinnamon French toast batter all over the top of bread cubes. 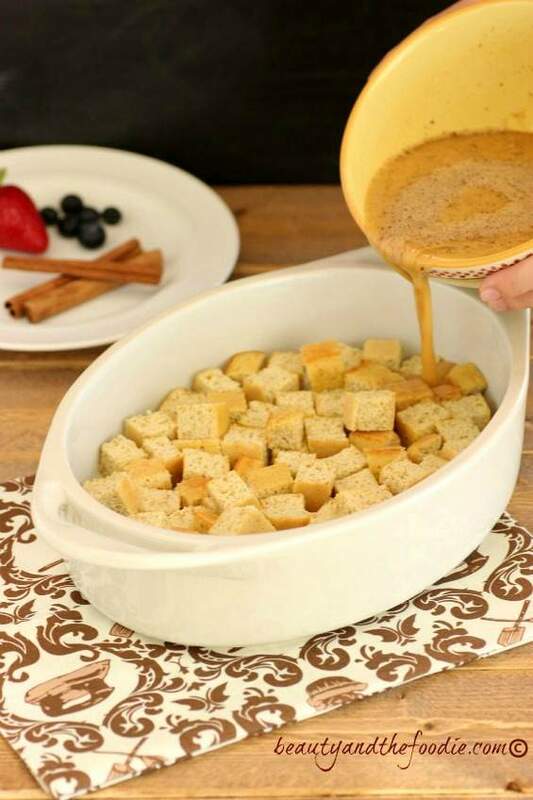 Pour the 2 tsp melted butter or coconut oil over top of casserole, then sprinkle with granular sweetener of choice. Bake for 25 to 30 minutes, or until all egg batter is firm. Remove from oven, and cool a little. Serve with syrup of choice and optional berries. If I use low carb bread how many slices would substitute your bread recipe? Making for breakfast tomorrow. It depends on the size of the bread slices. I had almost 2 cups of the cubed bread. I made this for the first time…awesome! But did add another layer of flavor..cream cheese, sweetener, vanilla almond milk, whisk until creamy…top on the casserole n then top with cinnamon n sugar! Wow I Hop has nothing on this! Tyty for the inspiration…think I will do loaves of bread n attempt to assemble like IHOP! Hi Stacey! This looks delicious recipe. however it is new for me. I will definitely go to try this in the weekend and finally will share my experience with you. Any way thanks for sharing. 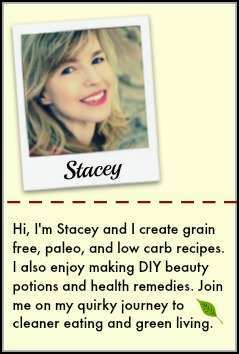 Do you think using ground chia seeds in place of flax meal would work? Michelle, I am not entirely sure, but I don’t think it would an ideal substitution. looks delicious. I know I’m going to make it. Do you have the carb count for just the bread? Thank you Sheryl, I will find the carb count for just the bread and email it you. I can add that to the post as well. Mary, you can use regular milk, but dairy milk does have more carbs than unsweetened almond or coconut milk. Find some organic half and half or cream, Mary Ann. You’re going to add a little to the fat/calories, but it’s better than the processed nut milks. Unless you are making them yourself. I don’t see the recipe or the card. Weird. Jeanie, it has been having issues. I’m trying to figure it out. 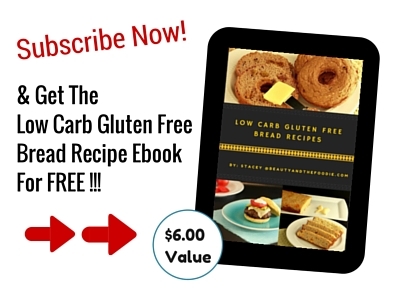 The link for the Low Carb Paleo Quick Bread in the recipe for tbe French toast casserole on FB and Pinterest doesn’t work. Hi Pam, it is not a link, the bread recipe and ingredients are also listed first on the recipe card. I had the two recipes listed on the same card. I put some spacing between them, as I realized it was hard to see it when they were too close together. Thanks for letting me know. 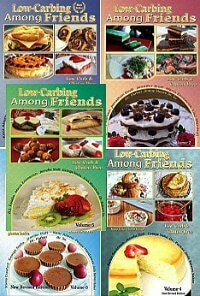 where do we find the recipes for these delicious dishes? Donna, the recipe is at the bottom of the post on a printable recipe card.